Named for the little girl who is featured in Gerard Manley Hopkins's poem, my little Margaret is a small art quilt that is mounted on a heavy paper collage "frame". 1. Create a compound image in Photoshop or other photo-editing software and print it out on an inkjet transparency. 2. 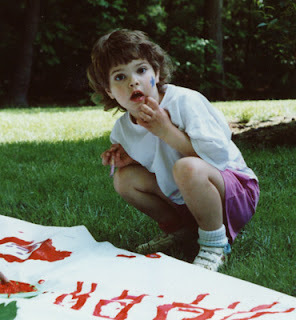 Make a fabric transfer onto muslin, following these image transfer instructions. 3. Arrange and stitch various fabrics to a muslin background. 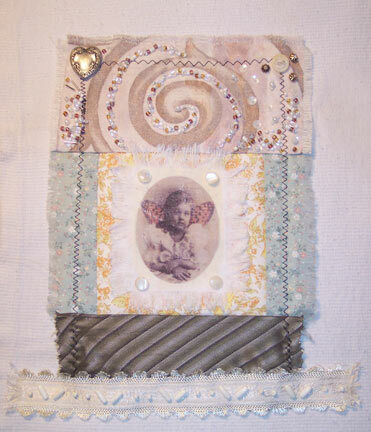 Add a layer of quilt batting and stitch together, adding beads and buttons for embellishment. Fray or finish the edges of the small quilt. 4. Stitch the quilt to a paper collage, tacking the corners and some other spots to keep it from sagging. 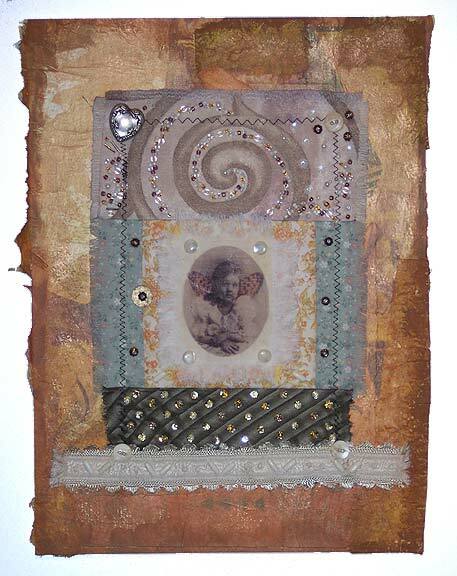 Mount the entire piece onto a heavy piece of mat board that is slightly smaller than the paper collage. Your image transfers always look beautiful. I love what you've done with this one. Thank you for visiting, Karen!